Is there a better alternative to LipSync? Is LipSync really the best app in AppleScript category? Will LipSync work good on macOS 10.13.4? 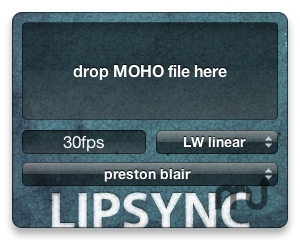 LipSync is a widget for converting Moho format phoneme animation files into Lightwave envelopes or After Effects keyframes. Preston-Blair and Simplified Flash phoneme sets are included along with user definable sets (more information on phoneme set translation can be found on iaian7.com). LipSync needs a review. Be the first to review this app and get the discussion started! LipSync needs a rating. Be the first to rate this app and get the discussion started! After Effects requires a pre-comp with phonemes on every frame (or every second). Once this is dropped into a parent comp, Time Remap can essentially select a phoneme based on its time in the pre-comp. To generate the Time Remap keyframes, choose the desired animation setup (AE frames or AE seconds) and phoneme set, then find your Moho file in Finder. Click and hold the file while opening Dashboard back up, and drop the icon into the drop zone. The widget will automatically save a plain text file to the same directory as the Moho file, as well as copy the keyframe data to your clipboard. As a reminder, the phoneme set is also displayed in the sequential order they should appear in the AE pre-comp. Back in your After Effects file, select the pre-comp from within the parent comp, press [ to go to the begining of the comp, and press cmd-v to paste the data. Time Remap will be automatically applied to the pre-comp, and the keyframes added. Unfortunately, you still have to manually set the keyframes to hold keyframes (otherwise the lip animations will bounce in time from phoneme to phoneme) - right click and choose toggle hold keyframe from the contextual menu.